Usually gravity assist maneuvers are used to accelerate a probe without expending propellant. But could gravity assist maneuver be used to brake and insert into orbit? Is there a formula to use for speed-deltaV-thrust that would be required at closest-approach for braking? consider the case of an interstellar probe to be able to brake in a target star using gravity assist. The speed of the probe doesn't change with regard to the assisting body. It is direction that is changed. If a hyperbolic orbit about the sun comes in with a Vinfinity of 5 km/s, it will exit with a Vinfinity of 5 km/s. Unless it happens to swing by a planet. From the planet's point of view incoming and outgoing speed are also the same. Again, it's direction that is changed. But a direction change with regard to a planet could be a speed change with regard to the sun. Thus a fly by of one of the gas giants might slow a hyperbolic about the sun to an elliptical capture orbit about the sun. 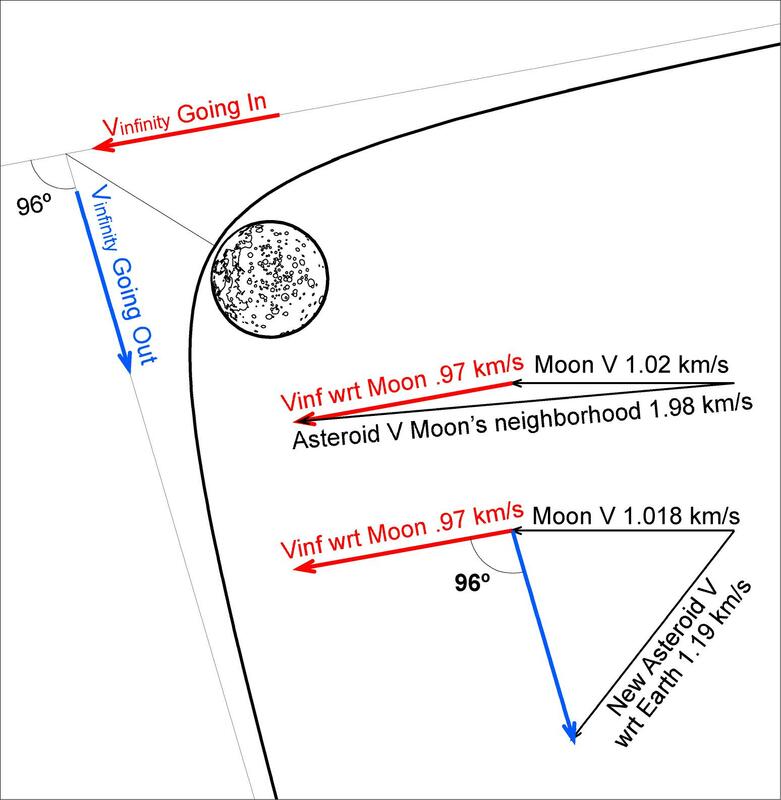 At the moon's neighborhood, earth escape velocity is around 1.5 km/s. Thus dropping the asteroid's speed from 1.98 wrt earth to 1.14 wrt earth brings the rock into an elliptical capture orbit about the earth. In a similar fashion, a swing by of one of the gas giants might trap an object from outside our solar system into an elliptical capture orbit about the sun. You can not use a gravity assist around a body to enter orbit around the same body, because a gravity assist doesn't change your velocity relative to the body you fly by. It only changes your velocity relative to other bodies. However, you can perform a gravity assist around a satellite of a body to enter the orbit of that body. You could, for example, perform a gravity assist around Ganymede to enter Jupiter orbit. The maneuver you're looking for is not called a gravity assist. A gravity assist can be conceptualized as a 3-body problem: body 1 (your spacecraft) picks up or drops off angular momentum that body 2 (the planet/moon) has in relation to body 3 (the body being orbited). No, you're not an idiot, this is actually a common pitfall encountered by many student astronavigators. The maneuver used to get captured into an orbit of your target planet or star is technically an Oberth maneuver, but is usually referred to as an orbital insertion burn. In your case, as you enter your stellar system's sphere of influence, you adjust your course to approach the star on a hyperbolic trajectory. You'll want to make the periapsis of that trajectory as close as possible to the star itself, but not so close that you burn up. Do your burn during your closest approach (that's the most efficient time) to change that hyperbola to an ellipse, and you have capture. You'll probably want to have a secondary burn at apoapsis to circularize your orbit to avoid repeatedly roasting your craft. Of course, if your target star has a gas giant in a suitable orbit, you might want to design your mission to use a gravity assist after all. Not the answer you're looking for? Browse other questions tagged interstellar-travel gravity-assist or ask your own question. Could the sun be used as a gravity assist outside the solar system (with current tech)? Could momentum transfer be practical (e.g., for orbital insertion at Pluto)? Why is Osiris-REx using an Earth flyby gravity assist? What are the disadvantages of gravity flyby assist?